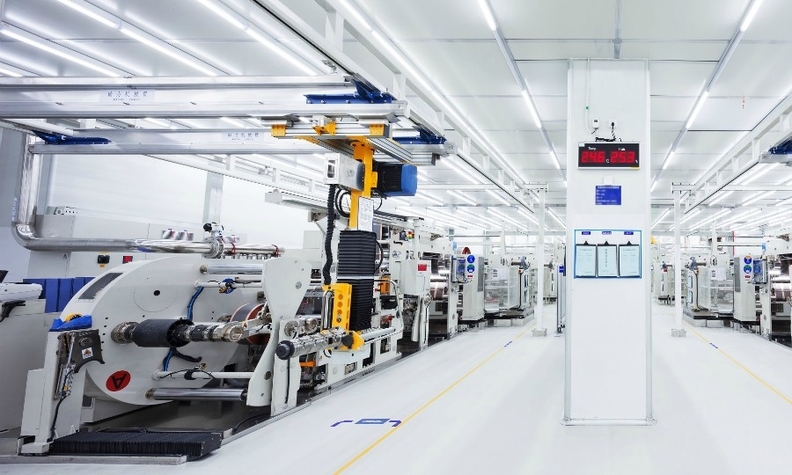 This CATL production line in China gives an idea of what the company will establish at its German factory, which is scheduled to be operational by 2022. Asia’s dominant battery companies are stepping up their investment in cell manufacturing operations in Europe to keep pace with electric car development, but European automakers haven’t given up on the idea of establishing their own cell production as the EV market grows. Less than 1 percent of global lithium ion cell production comes from Europe, but new factories or recently opened plants from heavyweights such as South Korea’s LG Chem, Samsung SDI and SK Innovation, and China’s Contemporary Amperex Technology Ltd. (CATL) will help boost that figure to between 10 percent and 15 percent of global production by 2025, estimates France-based technology consultancy firm Avicenne Energy. China is currently the dominant production center for lithium ion cells at 60 percent of the global total, with Japan second at 17 percent and Korea third at 15 percent, Avicenne estimates. The current lack of cell production is a barrier to Europe’s automakers achieving their ambitious plans to expand sales of electric cars, according to research firm Fitch Solutions. “Mass production of EVs in the EU is constrained by a lack of sufficient battery production capacity. Importing batteries from Asia remains costly,” it said in a note. LG Chem was the first Asian supplier to open a plant in Europe when it started production at a new Poland facility last year manufacturing cells for Daimler, Porsche, Volvo, Audi, Renault and Jaguar. The company is already planning to expand annual capacity to 70 gigawatt hours in the next few years from about 3 to 5 GWh now, according to Polish media reports that quoted Jong Hyun Kim, president of LG Chem Energy Solutions. The company didn’t respond to requests for comment from Automotive News Europe. CATL is scheduled to start production in 2022 in Germany at a factory that will start by supplying BMW. Samsung SDI has opened a plant in Hungary while SK Innovation has begun construction of a Hungarian facility that will open in 2020. Earlier this year SK Innovation said it would build a second plant in Hungary but declined to give an opening date. These cell plants, however, look relatively small compared with Tesla’s Gigafactory, a $5 billion U.S. facility in Reno, Nevada that in mid-2018 reached an annualized rate of roughly 20 GWh, making it the highest-volume battery plant in the world. LG Chem, Samsung SDI, CATL and SK Innovation were all named as cell suppliers last year for the Volkswagen Group, which is on course to become the largest cell customer in Europe. In March VW Group said it was planning to launch 50 full-electric vehicles globally by 2025 and increase its range to nearly 70 battery-powered vehicles by 2028. VW will invest 30 billion euros in electromobility by 2023 and will require battery capacity of 150 GWh per year by 2025. The automaker’s goal for its European-built EVs is to source all its cells in the same region, using the three Korean suppliers. CATL is VW Group’s nominated supplier for China. The automaker’s talks with SK Innovation to invest in gigafactories in Europe has reportedly already caused tensions with LG Chem, which currently holds a dominant position in cell supply in the region. LG Chem threatened to stop supplying VW Group if the investment went ahead, Germany’s Manager Magazin reported in February. Ultimately, however, VW Group wants to build cells. Batteries account for about 20 percent to 30 percent of the cost of materials in an electric car, which is why VW Group believes that developing battery technology in-house should be a “core competency,” the company said in its 2018 annual report. “In view of the constantly increasing demand, we are also taking a close look at possible participation in battery cell manufacturing facilities in Europe of our own,” VW Group CEO Herbert Diess told journalists at the company’s annual media conference last month. “In the future, [battery technology] will be one of the most important components for differentiating between products,” VW said in its annual report. Toyota is another automaker that wants a deeper stake in the production and development of batteries. The company is partnering with Panasonic to design its own cells. “It’s a huge challenge, but we believe it will become one of the key criteria for reliability and quality for our customers,” Didier Leroy, chairman of Toyota Europe, told journalists at the Geneva auto show last month. The company has no current plans to build cells in Europe. Even when they are not building cells, automakers are taking a keen interest in the chemistry. BMW, for example, is opening a second battery chemistry laboratory in Germany after outgrowing its first. “It’s partly so we are not reliant on the battery suppliers and we know nothing ourselves,” a spokesman said. BMW said it has $4 billion of future contracts with cell suppliers, including CATL. European suppliers and automakers should not believe they can compete with the Asian makers, at least for the current lithium ion technology, believes Roland Irle, co-founder of Swedish analyst firm EV-Volumes, which specializes in electric vehicles. “It is unlikely that Europe will play any significant role as a developer/owner of these technologies until 2025,” he said. Instead, Irle said, the focus should be on future technologies such as solid state, a more compact lithium ion battery that does not require liquid. One European company, Northvolt in Sweden, is hoping to challenge the Asian dominance with a huge $1.6 million plant in its home market. The factory is scheduled to open late next year and is expected to have a 32 GWh capacity by 2023, Northvolt said. Cells are expensive because of the raw materials needed to build them. Therefore, Northvolt hopes that by making the cathode element with help from the Sweden’s cheap renewable energy, it can build cells for less, especially when the switchover to solid state batteries happens. Northvolt even has a potential local supply from Europe’s first lithium mine in nearby Finland, which hopes to win customers attracted by its traceable and environmentally friendly extraction. In addition, Northvolt and VW Group announced late last month they would join forces to form the European Battery Union. The consortium will focus on the entire battery value stream from raw material production, to cell technology and cell production processes to recycling.